Dan 3:23 And these three men, Shadrach, Meshach, and Abed-nego, fell down bound into the midst of the burning fiery furnace. (3:24) And they walked in the midst of the fire, praising God, and blessing the Lord. (3:27) For thou art righteous in all the things that thou hast done to us: yea, true are all thy works, thy ways are right, and all thy judgments truth. (3:28) In all the things that thou hast brought upon us, and upon the holy city of our fathers, even Jerusalem, thou hast executed true judgment: for according to truth and judgment didst thou bring all these things upon us because of our sins. (3:29) For we have sinned and committed iniquity, departing from thee. (3:30) In all things have we trespassed, and not obeyed thy commandments, nor kept them, neither done as thou hast commanded us, that it might go well with us. (3:31) Wherefore all that thou hast brought upon us, and every thing that thou hast done to us, thou hast done in true judgment. (3:32) And thou didst deliver us into the hands of lawless enemies, most hateful forsakers of God, and to an unjust king, and the most wicked in all the world. (3:33) And now we cannot open our mouths, we are become a shame and reproach to thy servants; and to them that worship thee. (3:36) To whom thou hast spoken and promised, that thou wouldest multiply their seed as the stars of heaven, and as the sand that lieth upon the seashore. (3:37) For we, O Lord, are become less than any nation, and be kept under this day in all the world because of our sins. (3:38) Neither is there at this time prince, or prophet, or leader, or burnt offering, or sacrifice, or oblation, or incense, or place to sacrifice before thee, and to find mercy. (3:39) Nevertheless in a contrite heart and an humble spirit let us be accepted. (3:40) Like as in the burnt offerings of rams and bullocks, and like as in ten thousands of fat lambs: so let our sacrifice be in thy sight this day, and grant that we may wholly go after thee: for they shall not be confounded that put their trust in thee. (3:41) And now we follow thee with all our heart, we fear thee, and seek thy face. (3:42) Put us not to shame: but deal with us after thy lovingkindness, and according to the multitude of thy mercies. (3:45) And let them know that thou art God, the only God, and glorious over the whole world. (3:47) So that the flame streamed forth above the furnace forty and nine cubits. (3:48) And it passed through, and burned those Chaldeans it found about the furnace. (3:50) And made the midst of the furnace as it had been a moist whistling wind, so that the fire touched them not at all, neither hurt nor troubled them. (3:52) Blessed art thou, O Lord God of our fathers: and to be praised and exalted above all for ever. (3:53) And blessed is thy glorious and holy name: and to be praised and exalted above all for ever. (3:54) Blessed art thou in the temple of thine holy glory: and to be praised and glorified above all for ever. (3:55) Blessed art thou that beholdest the depths, and sittest upon the cherubims: and to be praised and exalted above all for ever. (3:56) Blessed art thou on the glorious throne of thy kingdom: and to be praised and glorified above all for ever. (3:57) Blessed art thou in the firmament of heaven: and above ail to be praised and glorified for ever. (3:59) O ye heavens, bless ye the Lord : praise and exalt him above all for ever. (3:60) O ye angels of the Lord, bless ye the Lord: praise and exalt him above all for ever. (3:61) O all ye waters that be above the heaven, bless ye the Lord: praise and exalt him above all for ever. (3:62) O all ye powers of the Lord, bless ye the Lord: praise and exalt him above all for ever. (3:63) O ye sun and moon, bless ye the Lord: praise and exalt him above all for ever. (3:64) O ye stars of heaven, bless ye the Lord: praise and exalt him above all for ever. (3:65) O every shower and dew, bless ye the Lord: praise and exalt him above all for ever. (3:67) O ye fire and heat, bless ye the Lord: praise and exalt him above all for ever. (3:68) O ye winter and summer, bless ye the Lord: praise and exalt him above all for ever. (3:69) O ye dews and storms of snow, bless ye the Lord: praise and exalt him above all for ever. (3:70) O ye nights and days, bless ye the Lord: bless and exalt him above all for ever. 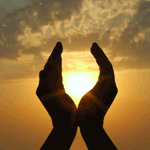 (3:71) O ye light and darkness, bless ye the Lord: praise and exalt him above all for ever. (3:72) O ye ice and cold, bless ye the Lord: praise and exalt him above all for ever. (3:73) O ye frost and snow, bless ye the Lord: praise and exalt him above all for ever. (3:74) O ye lightnings and clouds, bless ye the Lord: praise and exalt him above all for ever. (3:75) O let the earth bless the Lord: praise and exalt him above all for ever. (3:76) O ye mountains and little hills, bless ye the Lord: praise and exalt him above all for ever. (3:77) O all ye things that grow in the earth, bless ye the Lord: praise and exalt him above all for ever. (3:78) O ye mountains, bless ye the Lord: Praise and exalt him above all for ever. (3:79) O ye seas and rivers, bless ye the Lord: praise and exalt him above all for ever. (3:80) O ye whales, and all that move in the waters, bless ye the Lord: praise and exalt him above all for ever. (3:81) O all ye fowls of the air, bless ye the Lord: praise and exalt him above all for ever. (3:82) O all ye beasts and cattle, bless ye the Lord: praise and exalt him above all for ever. (3:83) O ye children of men, bless ye the Lord: praise and exalt him above all for ever. (3:84) O Israel, bless ye the Lord: praise and exalt him above all for ever. (3:85) O ye priests of the Lord, bless ye the Lord: praise and exalt him above all for ever. (3:86) O ye servants of the Lord, bless ye the Lord: praise and exalt him above all for ever. (3:87) O ye spirits and souls of the righteous, bless ye the Lord: praise and exalt him above all for ever. (3:88) O ye holy and humble men of heart, bless ye the Lord: praise and exalt him above all for ever. (3:89) O Ananias, Azarias, and Misael, bless ye the Lord: praise and exalt him above all for ever: far he hath delivered us from hell, and saved us from the hand of death, and delivered us out of the midst of the furnace and burning flame: even out of the midst of the fire hath he delivered us. (3:90) O give thanks unto the Lord, because he is gracious: for his mercy endureth for ever. (3:91) O all ye that worship the Lord, bless the God of gods, praise him, and give him thanks: for his mercy endureth for ever. Edited by patchworkid, 08 March 2016 - 07:57 PM. patchworkid:Loved asked for the 1611 version with Apocrypha not an updated version with Apocrypha. 1)the letter J always I and the U or V were interchange in the 1611. 2) musick was musicke in the 1611 version no matter how many fake reprints changed the spelling to musick. This is a better version but its lacks ironical "the other part of Dan 3"
Edited by Katoog, 09 March 2016 - 05:23 AM. Peace be with thee. I tried to download it from the link you provided here, but it does not work. How can I download your link? Obey Jesus. He is Lord.